Trees with smoother bark are better at repelling attacks by mountain pine beetles, which have difficulty gripping the slippery surface, according to a new study by the University of Colorado Boulder. The findings, published online in the journal Functional Ecology, may help land managers make decisions about which trees to cull and which to keep in order to best protect forested properties against pine beetle infestation. 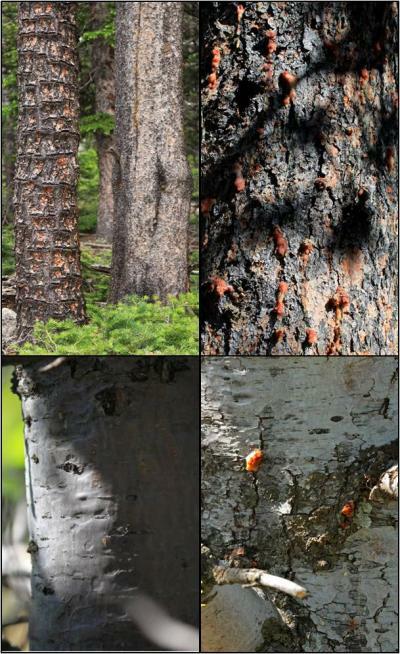 Clockwise from top left: This shows (1) two lodgepole pines growing side-by-side with notably different bark textures, (2) a rough-barked limber pine that has been attacked by bark beetles, (3) a limber pine that has both rough and smooth bark, with pine beetle attacks only on the rough bark, (4) a limber pine with predominantly smooth bark. Photo courtesy of Scott Ferrenberg. The current mountain pine beetle epidemic has spread across 3.4 million acres in Colorado since the outbreak was first detected in 1996. The tiny beetles, which are about the size of a grain of rice, bore into the pine bark. The trees fight back by exuding pitch, which pushes the beetles back out of the tree. Large-scale and continuous beetle attacks can kill the tree. Doctoral student Scott Ferrenberg, who led the study, said he first began to suspect that bark texture might affect the survival of trees while he and Jeffry Mitton, a professor of ecology and evolutionary biology, were walking through a stand of high-elevation limber pines. They noticed that surface resin, a residue of fighting off a beetle invasion, was common only on patches of rough bark. To determine which was the case, the researchers tested how well the beetles could hold onto different bark textures. They placed each of 22 beetles on a rough patch of bark and on a smooth patch. They timed how long the beetle could stay on each surface before falling. Twenty-one of the 22 beetles were able to cling to the rough bark until the test ended after five minutes. But all of the beetles fell from the smooth bark in less than a minute. The results — especially combined with the findings of a second study also recently published by the research team — provide information that may be useful to land managers who are trying to keep public parks and other relatively small forested areas healthy. In the second study, published online in the journal Oecologia, Ferrenberg, Mitton and Jeffrey Kane, of Humboldt State University in California, found that a second physical characteristic of a tree also helps predict how resistant the pine is to beetle infestation. The team discovered that trees that had survived beetle attacks had more resin ducts than trees that were killed. The number of resin ducts differed between trees of the same age, and in general, younger trees had more resin ducts than older trees. The number of resin ducts — which is related to the trees’ ability to pitch out the beetles — is easily counted by taking a small core of the tree. Because young trees tend to have smoother bark as well as more resin ducts, the research also suggests that land managers should consider cutting down some older trees when mitigating properties to resist beetles.